Plans have been announced by Carnival Corp. to build two new cruise ships at Fincantieri. One vessel is intended for the Holland America fleet, with the second for Princess Cruises. Work is proceeding on preparing the final contracts. This means that Carnival now has a total of 19 ships on order or planned, for delivery before 2022. Overall, Carnival now owns 10 different brands, and operates 102 ships in the cruise industry, with a total of 226,000 lower berths. Holland America’s ship will be built at Fincantieri at Marghera, with delivery scheduled for 2021. This will be the third vessel in the Pinnacle Class, and will be based on the design of Koningsdam and Nieuw Amsterdam. Each will accommodate 2,660 passengers. 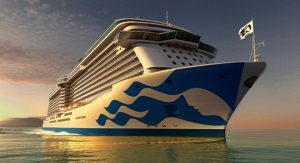 The Princess Cruises’ ship will be built at Fincantieri at Monfalcone, with delivery scheduled for 2022. It will be based on the Royal Class, and will accommodate 3,660 passengers. This announcement follows a similar statement issued by Carnival late last year, when it released plans to build three LNG-powered cruise ships. Two will be built by Meyer Turku, for Carnival Cruise Line; one will be delivered in 2020 and the second in 2022. The third vessel will be built by Meyer Werft at Papenburg, for P&O Cruises, with delivery in 2020. Carnival claim these new vessels will generate all of the necessary power from LNG, “to help us produce the most efficient and sustainable ships”.